IRVING, TX, (January 25, 2018) – Promotional Products Association International (PPAI) celebrated the 60th Anniversary of its Pyramid Award Competition awarding 44 Gold, 88 Silver, 12 Supplier Star and 10 Supplier Award of Merit winners at the PPAI Walk of Fame award ceremonies held January 16, 2018 at the Mandalay Bay Convention Center in conjunction with The PPAI Expo in Las Vegas, January 14-18. Since 1958, the PPAI Pyramid Awards have recognized and honored promotional products businesses and helped shine the spotlight on the collaborative business model unique to the industry. 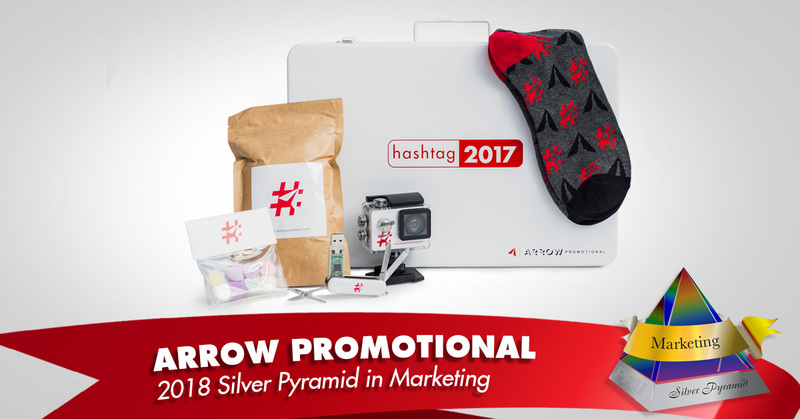 Arrow Promotional, was presented a Silver Pyramid Award in (Marketing) for the 2018 Pyramid Award Competition.